HODIE 3a vice lecta est Billa, That the Duke of Norff. by the Advice of the Lord Chancellor, the Earl of Arundell, and the Bishop of Ely, may make Sales and Grants during his Minority, que communi omnium Procerum Assensu conclusa est. 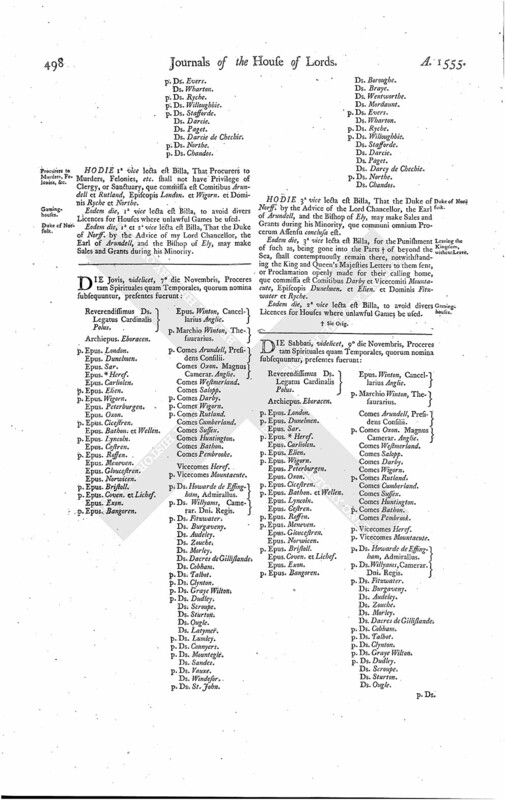 Eodem die, 3a vice lecta est Billa, for the Punishment of such as, being gone into the Parts † of beyond the Sea, shall contemptuously remain there, notwithstanding the King and Queen's Majesties Letters to them sent, or Proclamation openly made for their calling home, que commissa est Comitibus Darby et Vicecomiti Mountacute, Episcopis Dunelmen. et Elien. et Dominis Fitzwater et Ryche. Eodem die, 2a vice lecta est Billa, to avoid divers Licences for Houses where unlawful Games be used.